Thank you Rocky for those kind words...greatly appreciated. What a lovely group of people we have here at this site. Bless you all. Anita Hi, yes I was so lucky I had those medical papers packed into a large bag over my shoulder..Phew...I dread to think what could have happened..
Hi Danielle , My heart goes out to you and your husband for what you guys are going through. I was a caregiver for my husband while he fought his cancer and I know how tough it has to be for you. I was glad to read about your trips and the time you two have gotten to go and be together. That time has to be priceless. My husband owns a constrution company so even going through the cancer , (his and mine ) there has not been a time in the last four years for us to get away. Thank God for those medical papers and the padding to break your fall. I'm glad no broken bones. Prayers are with you and your husband. 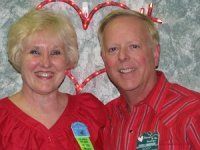 Thank you Herb for those lovely words...I love my husband so very much..We have been together now for 48 years.We are not spring chickens any longer..Hubby is 73 and I am a month or two short of 70 years. To say. I am sorry cannot express my feeling but I want you to know how much your love for husband is a blessing and it gives him the will to grab what strength he can, your love has and will continue to uphold him and remind us all what the love of others has done for us. I continue to continue because of my loving wife and friends which includes those who try so hard to reach out through these 'bits and bytes.' You are not alone. In the meanwhile we are just passing day by day with hope of some improvement after the next bout..
You won't believe what happened to me this morning...As we were leaving the clinic,still in the foyer, I slipped on spilt yogurt and landed on my hip, hand and shoulder..I had my shopping bag, with all the medical papers that side and that buffered the fall...My hand is a little painful, but I am lucky I am well padded in certain areas, (no comments please) and was extremely lucky no broken bones...Who will care for the Carer??? Last edit: 6 years 4 months ago by danielle.